Planted poplars in farm shelterbelts are a common sight on the Canadian prairies, and perhaps most frequently in Saskatchewan. Somewhat less well-known, but equally important, are the native willows that grow on the prairies. 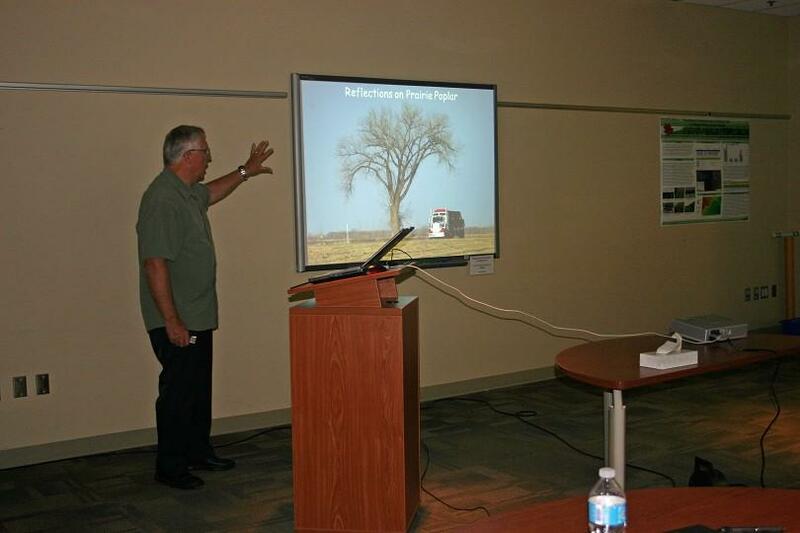 Both poplars and willows were presented and discussed in the 2016 annual meeting of the Poplar and Willow Council of Canada which was held in Regina and Indian Head, Saskatchewan over two days in July. The meeting was hosted by Agriculture and Agri-Food Canada (AAFC) and smoothly organized by PWCC Chair Raju Soolanayakanahally and Bill Schroeder, with the able assistance of Laura Poppy and Tricia Ward. Although the participants were few in number - 12 in all, from six Canadian Provinces - they were joined on the field-tour day by a number of additional friends and colleagues. 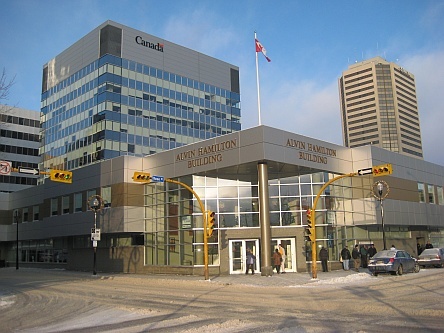 For the first day, the group gathered in downtown Regina at the Alvin Hamilton federal government building where eight technical presentations were made (seven oral and one poster). These all focused in one way or another on the overall theme for the meeting which was 'Exploiting poplar and willow genetics for environmental applications'. On the eve of his retirement from AAFC, Bill Schroeder reflected on over 100 years of poplar planting in prairie shelterbelts, and 75 years of poplar breeding at Indian Head in support of that planting, breeding work in which he has played a major part. 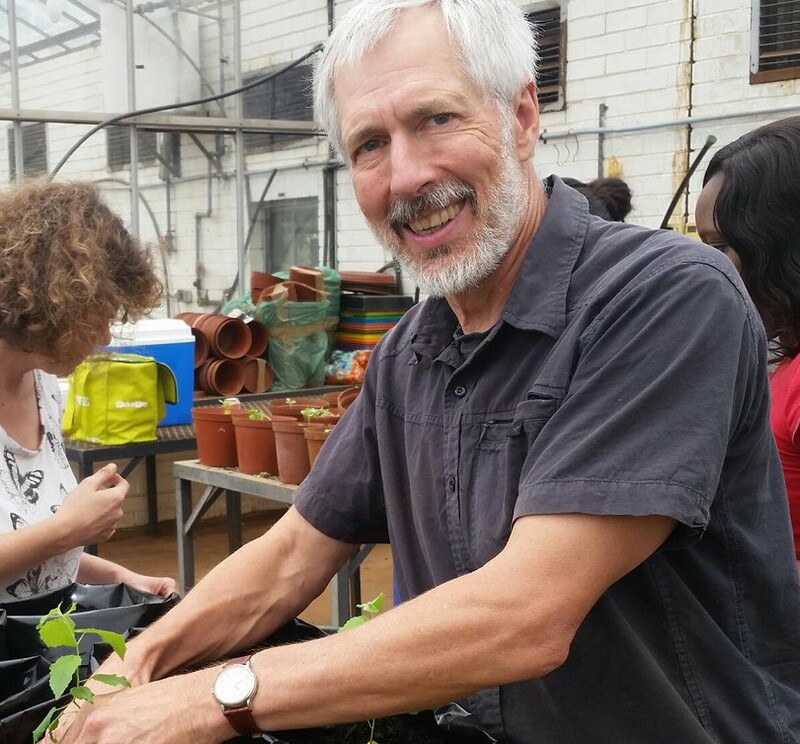 Carl Douglas of the University of British Columbia (UBC) presented a paper on understanding genetic variation across the ranges of Populus trichocarpa and P. balsamifera and using that knowledge to accelerate genetic improvement. Sadly, this was to be Carl's last scientific presentation, as just a very few days after the meeting, he lost his life in a tragic mountain-climbing accident in the Rocky Mountains. Two of the presenters were the 2016 recipients of the PWCC-UBC Student Travel Awards. Md Shayeb Shahariar, a graduate student at the University of Saskatchewan, and Yue (Bobby) Hu, a graduate student at the University of Alberta, each spoke on their work, Shayeb on the effects of short rotation willow on prairie wetland soil hydrology, salinity and macronutrients, and Bobby on assessing the potential for hybrid vigour from disparate population breeding of balsam poplar. Raju Soolanayakanahally spoke on a study of willow stomatal density and pore length trade-offs which used populations of Salix eriocephala from across its natural range in Canada. Annie Desrochers presented the results of a study showing that root connections between balsam poplar trees can affect radial growth through a sharing of resources. Finally, Jim Richardson offered a glimpse of photos which will be inclued in an international online photo gallery illustrating all aspects of the Salicaceae. All technical presentations are available in PDF format on this website. 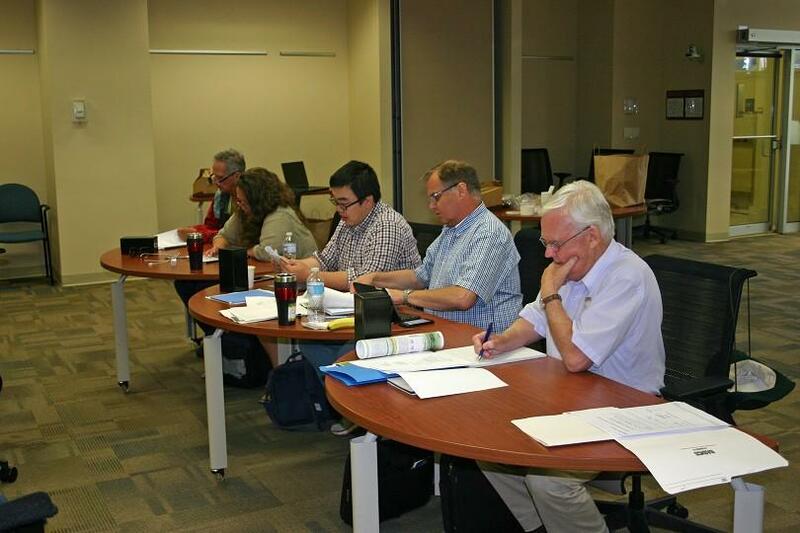 The annual business meeting of the Council took place at the end of the first day in Regina. Reports were received, plans were discussed, and elections were held for the Board of Directors. Raju Soolanayakanahally remains as the PWCC Chair. Bill Schroeder was elected to serve as Vice-Chair West, replacing Cees van Oosten who has stepped down from that position. There were no other changes in Board membership, though the untimely death of Carl Douglas leaves one vacancy. Those present agreed with the proposal that the 2017 annual meeting of PWCC be held in conjunction with the conference of the North American Forest Ecology Workshop in Edmonton in mid-June. Bill Schroeder gives a presentation. 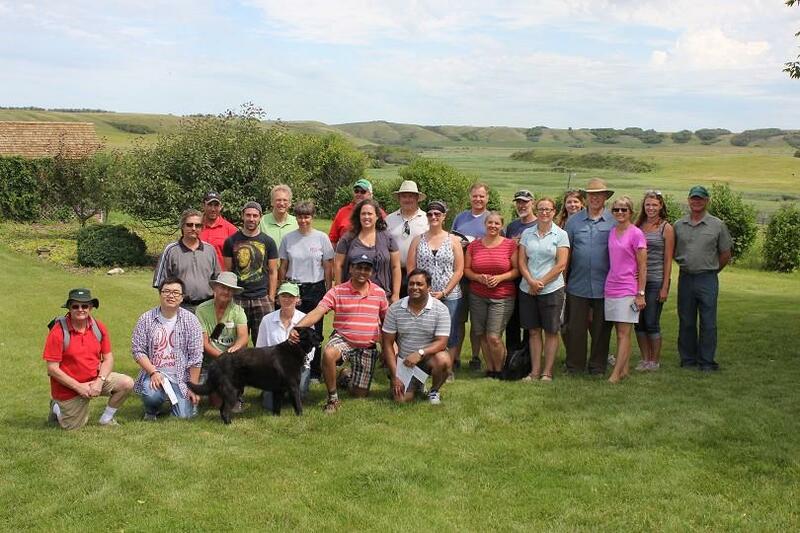 On the second day, participants travelled east of Regina to Indian Head and the Indian Head Research Farm of AAFC for a full day of field visits. After a round of welcoming sea buckthorn smoothies on arrival, the group visited first a tree improvement seed orchard with a test of 12 different Russian and Estonian sources of Siberian larch, a green ash seed orchard with 61 plus trees, and a Scots pine seed orchard containing the results of 80 years of testing and crossing Scots pine at the nearby Shelterbelt Centre. 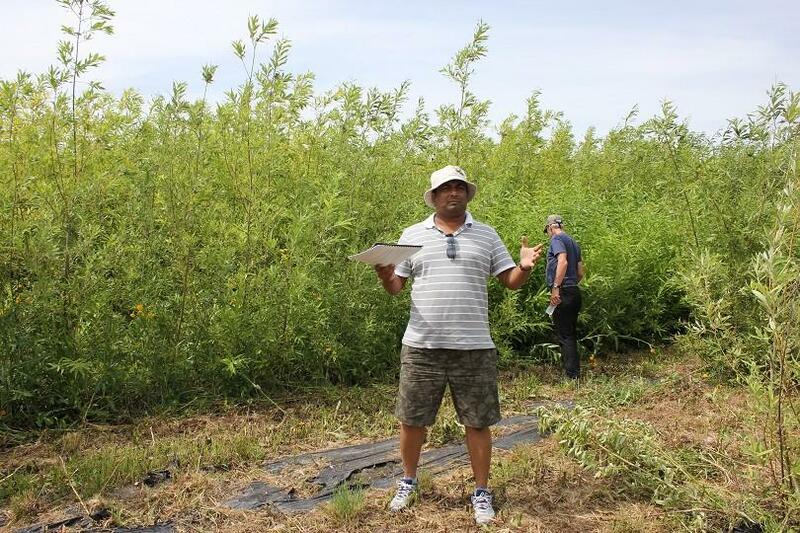 The second stop was at a two-year-old project investigating the benefits and economics of alley cropping (or 'intercropping') of the berry shrubs sea buckthorn and buffaloberry with alleys of alfalfa and brome forage crops. Three different alley widths (5m, 15m and 26m) were being tested in this managed field boundary habitat agroforestry study. The third stop for the morning was the AgCanSalix (willow) common garden. Collection of the willow germplasm began in 2005 and the material was moved to the present site in 2015. It includes 34 populations, mainly native willows, but also including 10 hybrid lines from Sweden and 12 clones. Key traits being sought are biomass production, nutrient accumulation and nutrient turnover, and adaptability to local growing conditions. 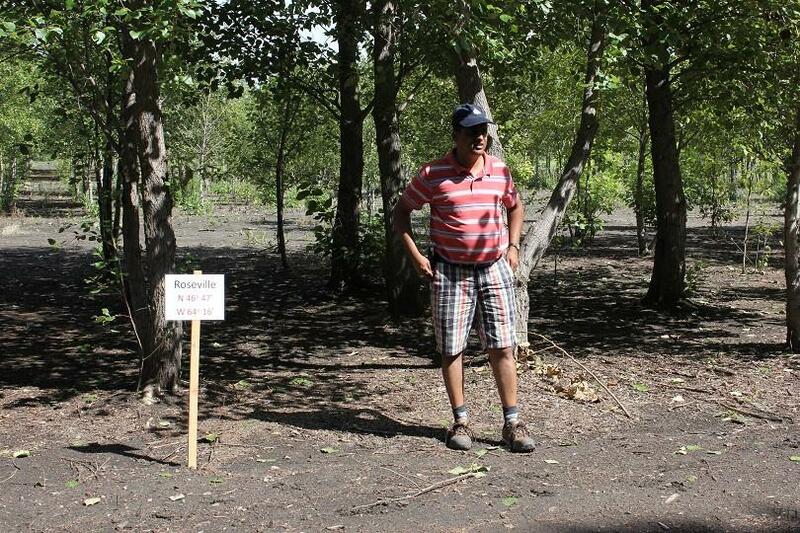 Afternoon visits included the wetland willow study which Shayeb Shahariar had presented during the technical session the previous day in Regina. The effects of short rotation willow on soil hydrology and salinity in the riparian zone of Prairie wetlands were compared to those of annual crops and pasture. Differences in soil exchange capacity were found among the three land use systems over the two growing seasons of the study, with short rotation willow causing a greater decline in soil salinity on one of the two sites included in the study. Research Farm. Photo: Garth Inouye. project, Reynard Farm, Indian Head. 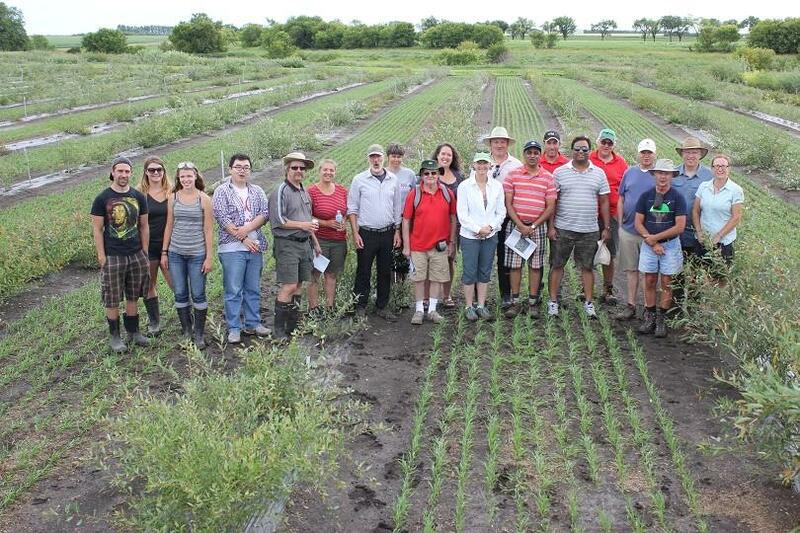 The final stop of the field tour was at the AAFC Balsam Poplar (AgCanBaP) collection of germplasm from 65 native wild populations of balsam poplar from throughout the full extent of its very wide natural range. The genomes of all trees in the collection have been sequenced and wood characteristics analysed. Efforts are now being made to correlate genotype and phenotype, and to compare this material with P. trichocarpa. North-south crosses have been done and the results planted out with plans to observe segregation in the the F2 generation. Participants in the field tour enjoyed a relaxed outdoor pizza lunch at The Grazing Goose farm, the pizzas being baked outdoors in a mobile oven. 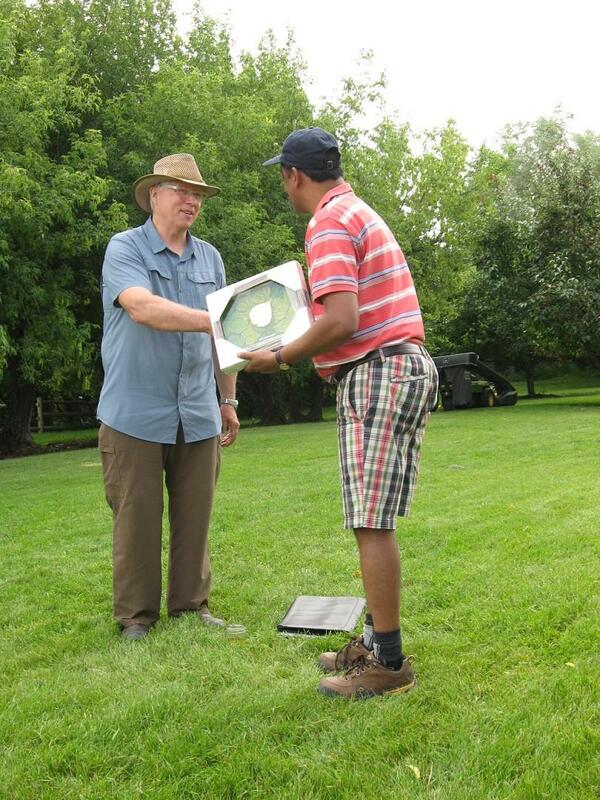 Pleasant summer weather and the rolling lawns of the farmhouse provided the perfect setting for informal mingling of friends and colleagues, group photos and presentations. The latter included the first of a new series of PWCC awards - the 'Poplar Gold Leaf' - which were presented to Bill Schroeder of AAFC and to Pierre Périnet of the Quebec Ministère des Forêts, de la Faune et des Parcs for their lifetime contributions to poplar and willow breeding. (In his absence, Pierre's award was accepted by Annie Desrochers and Lyne Blackburn.) The two Student Travel Awards, mentioned above, were also presented. farm, near Indian Head. Photo: Garth Inouye. In addition to the photos included in this article, a complete photo gallery is available from the meeting. As noted above, all technical presentations are also available in PDF format.